You know the Law of Attraction states thoughts become things. You know you need to focus your thoughts on the things you want, not on the things you don’t want. Yet, no matter how well you focus your thoughts on what you want, the Law of Attraction still requires that you take inspired action by acting upon the opportunities that come to you. Let me repeat that: To get what you want, you must take inspired action to make your desires reality. But what is inspired action…how do you know when to take it? Ideas will come to you, little hunches if you will. They are the kind of thoughts that you'll notice, maybe look at, but often dismiss. You should follow these ideas. They are your path to manifesting your desires. Think of them as breadcrumbs that will lead you where you want to go. These breadcrumbs can come in any form, from ideas to signs on the road to comments overheard in passing. They are anything that reminds you of what you are asking for. Often you may ignore them, but they are the Universe telling you to act now to receive what you have asked for. When you follow the breadcrumbs, you are taking inspired action. The breadcrumbs are how the Universe speaks to you. It isn't going to sit there and specifically tell you to do “x, y and z.” But it will guide you. It will show you the way if you will let it. Sometimes you might get these breadcrumbs, but then disregard them because you aren't certain as to their meaning. But you need to listen to them. No matter how irrelevant they may seem at the moment, stop, listen, and act. As soon as you ask for what you want, pay attention. Look for ideas and signs that will lead you to your desires. If you have even the slightest, most remote thought that something is connected to the manifestation of your desire, pay attention and act upon it. If you want to manifest a car and you have an idea that you should speak to someone or stop by a certain car dealership, those are signs from the Universe. They are inspired actions you are meant to take. If you disregard the idea as irrelevant or come up with reasons why you shouldn't speak to the person or stop at the dealership, you make it harder for you to receive your car. But you might feel a sudden urge to buy a lottery ticket from a certain store or at a certain time. It could be a place where you've never bought one before. It might even be a nudge that instead of buying just one, you should buy two. Why? It could be the second one that will be the winning ticket. The key is to pay attention to your nudges and to act on them. 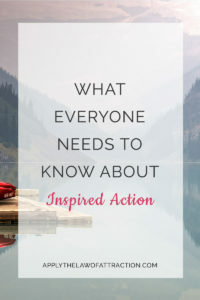 How do you know if an action is truly inspired? Sometimes you might feel the nudge to act, but it isn't inspired action. It is coming from your ego, not the Universe. Inspired action feels good. Ego-based action is based in fear (fear of losing someone, fear of failure, fear of success…). Inspired action is comfortable. Ego-based action occurs when you feel impatient. Inspired action is fun. Ego-based action is when you want things to happen in a specific way, such as someone sending you a specific text message after a date. Inspired action comes to you unexpectedly. Ego-based action arises when trying to figure out how things will happen. Inspired action comes from a place of allowing. Ego-based action is based on attachment to the outcome. Remember…if you want to fully harness the power of the Law of Attraction…you need to ask, stop, listen and take inspired action. So true!! Sometimes you won’t notice that an opportunity is staring you in the face until it passes you by. So, I’ve gotten better at realizing that the opportunities exists, and then I need to simply reach out and take it. It’s so easy when it happens, that things instantly fall into place for me. Thanks for this beautiful website..!! I’ll be back for more inspiration. I completely agree Steph! It’s all about taking the opportunity when it presents itself. It’s there for a reason and we have to realize that following the little signs is so much easier than listening to our doubts and fears. I’m glad you enjoy the site! However, I have not received the copy yet. How long does it take to get processed? I believe it is automatically delivered to your kindle reader or app, whichever you are using to read it. If you are having problems with it, you need to contact amazon.com’s customer support. They can help you solve the issues you are having. This is what I’ve been wondering for years now…I never get any type of signs or hunches even though I honestly look for them. I never get any hunches to take any inspired action or do anything different,…so its like, what gives ? Im trying to pick up on signs but they never come. This is so true! I was smiling when I read this article cuz it complemented my thoughts. I thought I’m crazy because I was telling myself “girl! this is a sign” whenever I hear or find anything related to my desire. It is really comforting to know that our revelation is a response from the universe to our desires.